Are you ready for the Summer Holidays? Baba certainly is! We are off to see my friend E in Spain later on in July and he has already prepared his suitcase! As the Frenchie bébé is a real fashionista, he only travels in style. 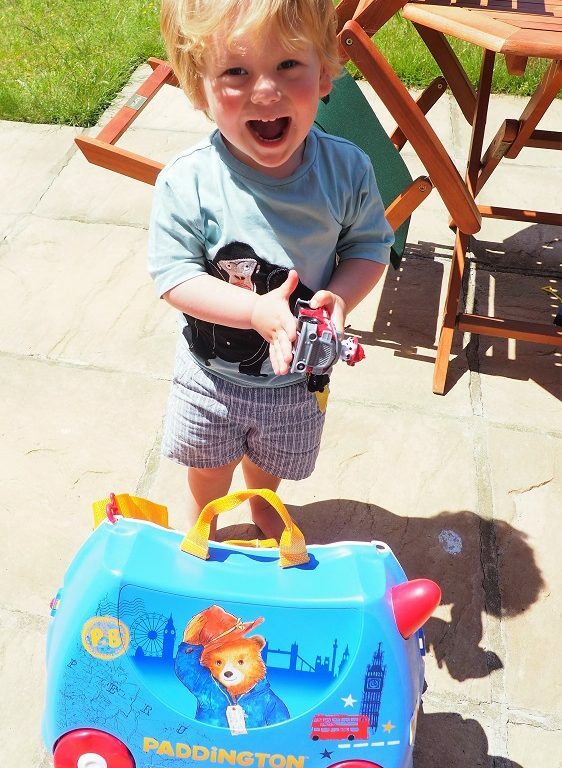 Any cool toddler has a Trunki! If your little one is yet to have one to take with them all their beloved belongings, time to enter this special giveaway with Living Arrows 26/53! Win a Trunki of your choice worth £39.99! 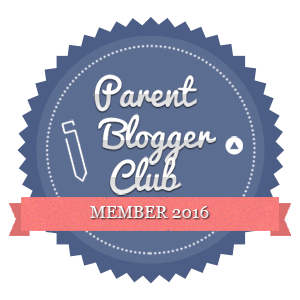 Living Arrows 26/53 – Ready for the Summer Holidays! The Summer has officiellement started this week! Hurrah! I don’t know about you but we are ready for it! I can’t wait to go abroad and Baba too! Actually, it will be his first trip on a plane and I can’t wait to see his reaction when we board and everything! So, are you prêts to see how to pack up? Here are top 3 tips to do so en images! 2. Select an endless collection of toys that you want to take with you. It involves way too many cars and 1 or 2 teddies in case you would be in need of cuddles. 3. 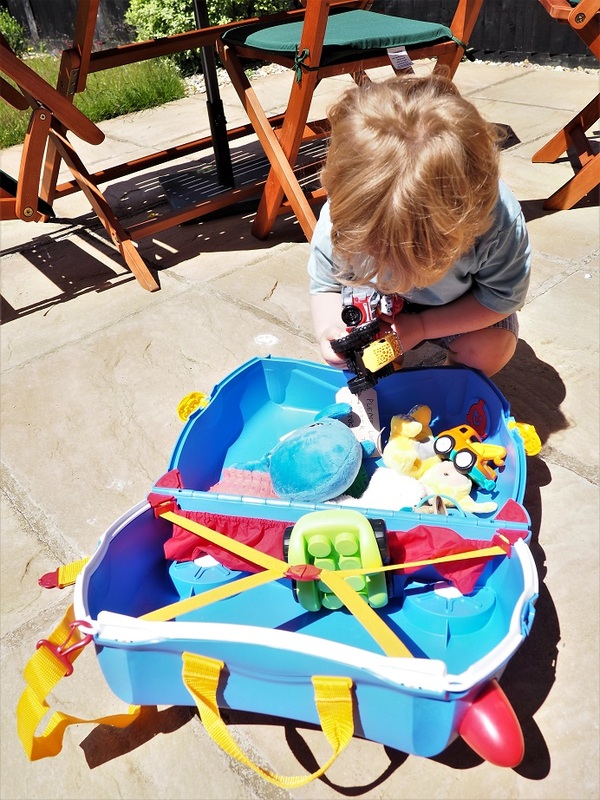 Close the Trunki and keep 1 of your fave jouets with you. Smile! Bravo, tu as fini! I wish my life was that facile. It will certainly take me way longer to prepare my suitcase when we leave… I hate having to select my outfits. I want to take all my shoes! 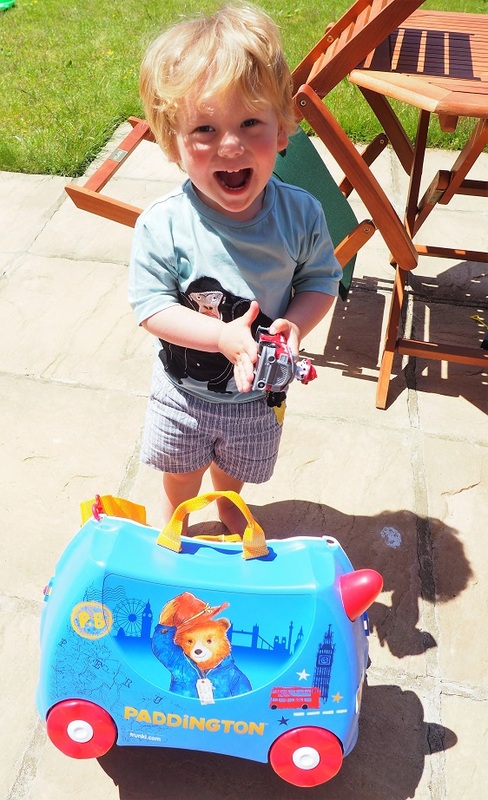 Win a Trunki for the Summer! Fancy one of these cool suitcases? They are so fun for a day out or a vacation. We love ours! 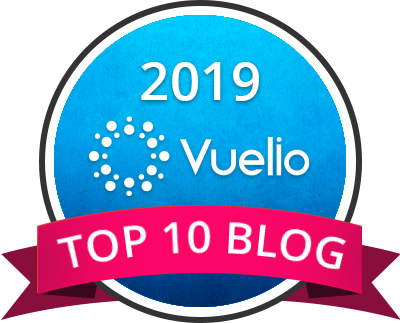 See our 30 reasons if you need further convincing! Plus imagine, it’s also a fab car to ride! Win a Trunki of your choice worth £39.99 now via Gleam! This giveaway starts on Sunday 24th at 8 pm and ends at midnight on the 24th of July. Provision of the prize is the responsibility of Trunki. Frenchie Mummy can’t be held responsible. Disclosure: We received a Trunki for free but all those fabulous tips to pack up your bag in seconds are our own and only! I would pick the Paddington, my little Grandson loves him! Love the Bus! Thanks for the chance to make my granddaughter happy, she would love this. I love the Bluebell Pony Trunki. I like Una the Unicorn. I love the Paddington Trunki! Ahhh your boy is adorable, it’s been lovely watching him grow over the past few years. I like The Gruffalo Trunki. Frank the Fire Truck is our favourite. I always find there’s few seats at the airports we’re in often so Trunkis are great for resting little legs and they are vibrant to stand out in busy places. I think number 2 grandson would love Frank the Fire truck (No. 1 is in Fire Cadets). The unicorn one! It’s gorgeous. Thank you for the chance to win. the fire engine is amazing for my little boy or my princess would love the unicorn one! What a fun post. We would be totally lost without Olivias trunki. When the time comes I hope you have a great time in Spain. Bernard the Bee is my favourite but the entire range is fab. That Paddington Trunki is so cute! Got to be Una the Unicorn. The unicorn or the fire engine. My daughter likes both of them. I love the Padington Trunki. So difficile but would probably choose the tiger! I love the Dinasaur one ?????? What a cool suitcase !! Loving the unicorn ! So spacious and sturdy too ! Una the Unicorn!! So so sweet. I’d want to use it myself ? 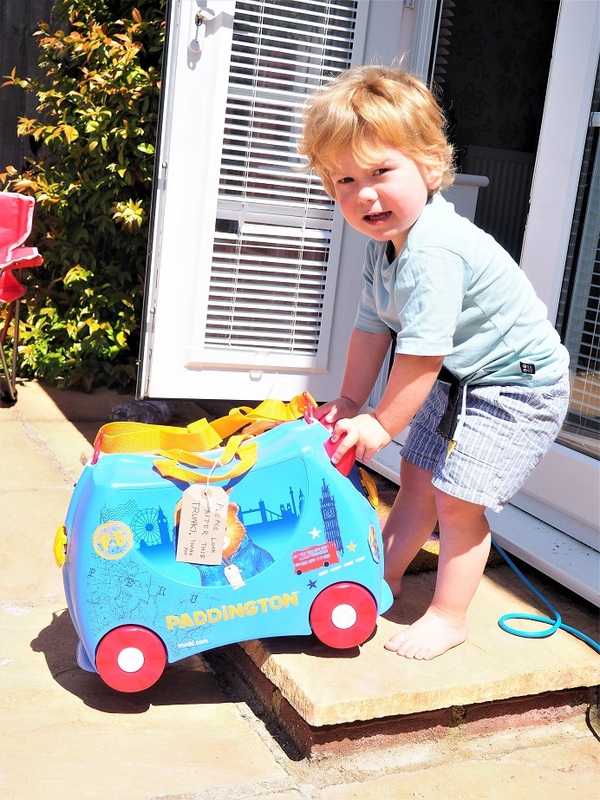 Aww…bless him – Baba looks so happy with his Paddington trunki – I hope you have a great trip to Espana in July. I love trunki’s..they are brilliant for children – my fave is the brown Gruffalo design. I love the Paddington one but the unicorn one would be so lovely for my niece ? My daughter would love the The Bluebell Trunki. I can’t resist the Gruffalo inspired design! Brilliant! It has to be the Paddington one, my little one love him, i spent most of Christmas at Marks and Spencers just trying to get their paddington bear and eventually managed to get one. Much as I like Paddington, I think it would have to be the Gruffalo for us, please! Love the Paddington Trunki but it is difficult to choose a favourite! love the unicorn one, and the paddington bear one, both equally gorgeous! Paddington, and the kids agree!! The yellow taxi cab one – so cool and both my kids would love it! I like them all so difficult to pick just one, but Paddington. We love Benny the Cat. Una the unicorn, for the simple reason it’s a unicorn! Our daughter had the Trixie one when she was younger and as it is our cats name too, she used take it everywhere telling everyone she was taking her cat for a walk. It’s got to be Paddington….loved by young and the not so young. Has to be my first pick. I love that these are so fun yet practical! Trunki’s are brilliant especially for whizzing around the airport! I am a Paddington Bear fan so That would be my favourite! I love the Paddington one. I have watched the two films hundreds of times with my son. They are his favourite films. I would love to win Benny the Cat trunki for my daughter. I like Cassie the Cat. My daughter would love the Paddington Trunki, it is one of our favourite books and films. 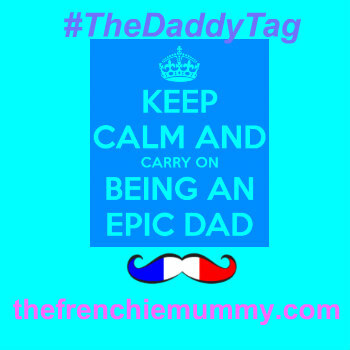 i actually love them all – my daughter has a fab pink one but i would love to win a trunkisaurus for my nephew. Boris the Bus is so much fun with all the animals! Aww so many lovely designs to choose from. Either the Paddington design or the Gruffalo I think for my Nephew. Our Hello Kitty one was lost (or stolen) at Heathrow, so I’d love to replace that. But, since I think it’s no longer produced, I’d let my daughter choose. I think she’d really like the new fairy one or one of the cats. We absolutely love Benny the cat. Our P is crazy about kitties! I like the George model. Harley Ladybird – bright and beautiful. I would go for Paddington. Paddington … we are massive fans! We love the Trunkisaurus Rex – rooooarsome! I love the Trunkisaurus Rex! ?? I’d love Flora the Fairy for my little girl, the colours are lovely. my grand daughter would love Flora the Fairy or una the unicorn. thanks for the chance and fingers crossed this would be perfect as my grand daughter travels lots as we have family all over in Wales Devon Cornwall etc she would love a trunki. Oh my, i’ve just fallen in love with the Paddington trunki. I think the brand is fun and colourful and gets kids involved in the packing. The range is fantastic too, as well as the customisation. Cassie the cat is so cute! Next Next post: The Big Summer Giveaway – Win over £720 Worth of Goodies!